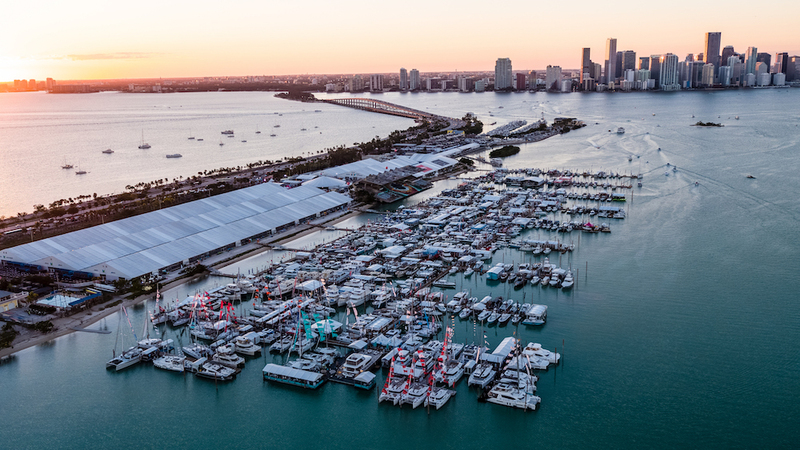 Numerous builders will introduce new models at the 2017 Miami International Boat Show, but these five models from Albemarle, Belzona, Cruisers, Scout, and Tiara are must-see launches. 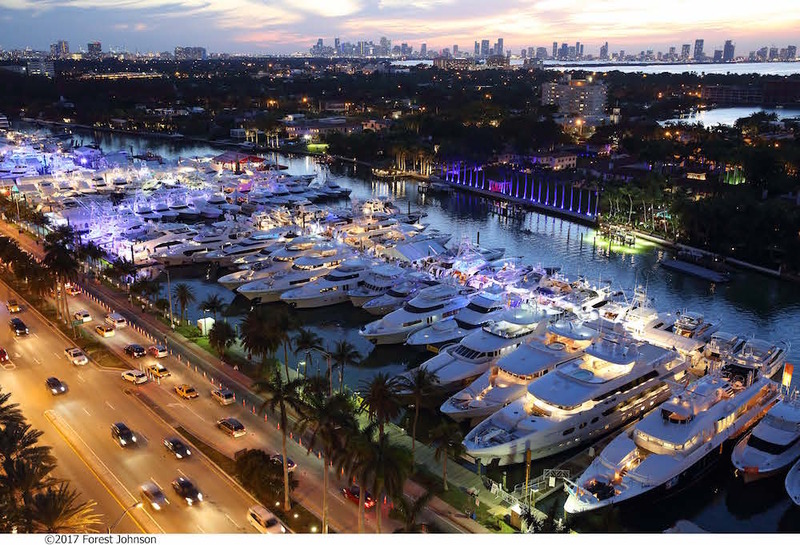 Every year the Miami International Boat Show brings with it a crop of hot new boats, and just as we did in 2016 with our show preview Hot Boats Coming to the Miami International Boat Show, we’ve been poking and prodding our industry contacts to find the top five must-see boats that will be splashed for the 2017 show. Our list started with dozens of possibilities, but we’ve whittled it down to these five entries from Albemarle, Belzona, Cruisers, Scout, and Tiara. That’s not to sell the others short—it was a tough call, making this list—and show-goers will have plenty more to check out. But whatever you do, don’t miss out on these hot new rides. Albemarle may be a rather traditional builder, but they break new ground with the 29 Express. The 2017 Albemarle 29 Express eclipses the 25 Express and 27 Express as this builder’s largest outboard-powered offering. It rides on a 24-degree deep-V hull design, tips the scales at 13,000 lbs., and can carry 320 gallons of fuel. The capacity figures that will get the attention of anglers, however, are found in the twin 56-gallon fishboxes and the 30-gallon transom livewell. And there’s more to be found in the cockpit that fishermen will find attractive. Unlike many boats in this size range the Albemarle has big-boat features like a stand-up tackle station/rigging module and mezzanine-style aft-facing seating. The cabin features a small galley to port, a fully-enclosed stand-up head to starboard, and a convertible V-berth/dinette forward. Power comes in the form of twin Yamaha F300 or Yamaha F350C outboards. For more information, visit Albemarle. Red Alert: There are already a few Albemarle 29 Express listings on boats.com. Belzona has established itself as a serious fishboat builder over the past few years, and with the 277 Walkaround they’re venturing into new territory. Belzona first appeared on the scene just five years ago when they introduced the 325 Center Console, which looked quite futuristic and had a unique sliding gunwale door. 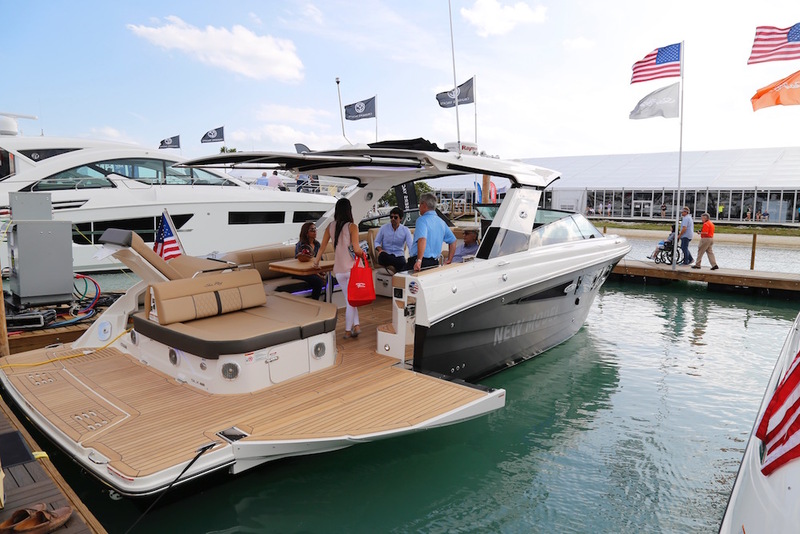 This year they roll out their third and smallest model, the 277 Walkaround, which swaps out the sliding door for a swing-out dive-door in the side. It still, however, has that uber-modern look, with forward-sweeping hard-top supports, a curvaceous transom, and a rounded walkaround cabin featuring a forward berth and an enclosed head compartment. 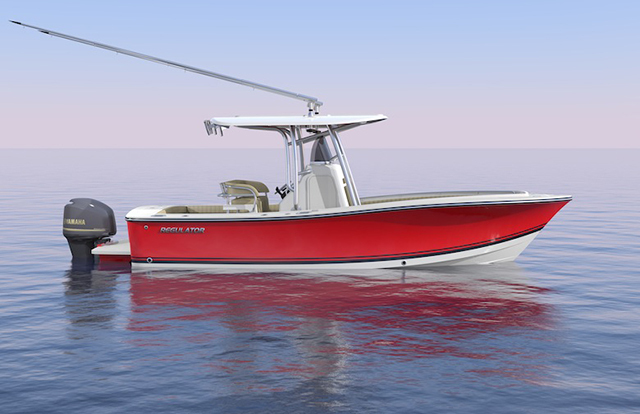 The 277 is available with Mercury Verado powerplants, in 200, 225, and 250 HP. 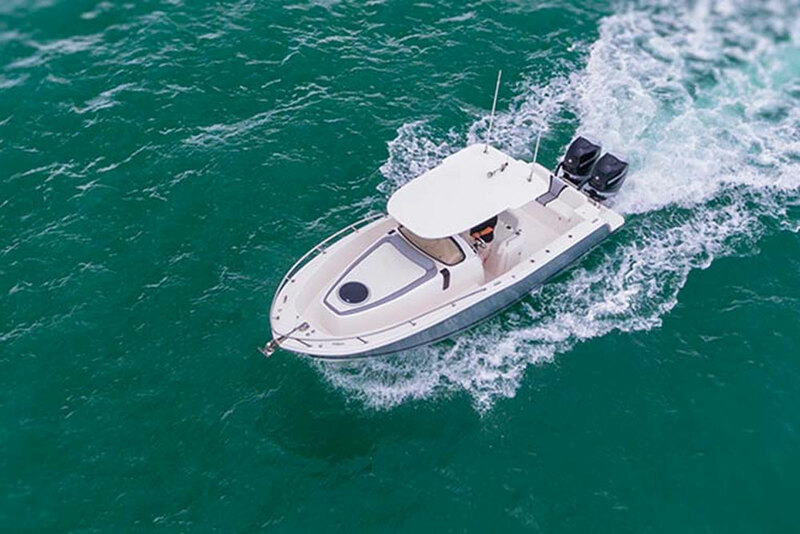 It also comes with a number of surprising perks listed as standard features for a boat of this size, like a freshwater system, a Fusion stereo system, auto-retracting stainless-steel trim tabs, and a fixed electric MSD with an 11-gallon holding tank. For more information, visit Belzona Marine. The 277 Walkaround is too new for any listings to appear just yet, but if you like the looks of this boat take a peek at these Belzona 325 and 327 listings. 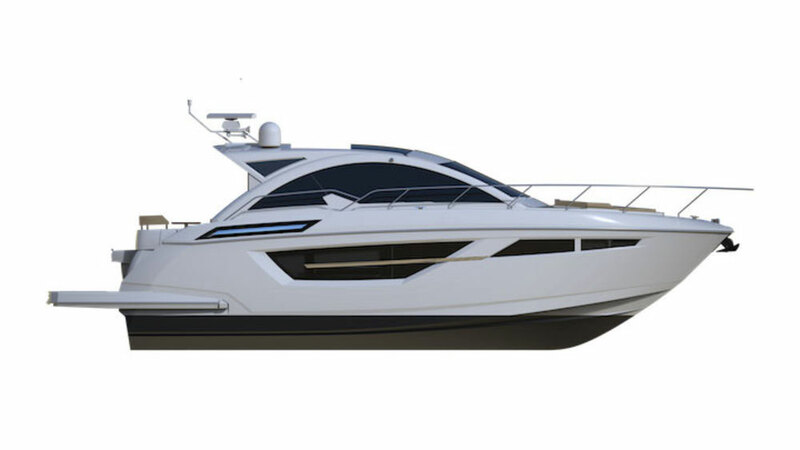 The new Cruisers 50 Cantius joins a line-up of 11 popular Cruisers yacht models. Following close on the heels of the introduction of the 54 Cantius Fly just a few short months back, the 50 Cantius plugs a hole in this manufacturer’s line-up between the 54 and the 48 Cantius models. 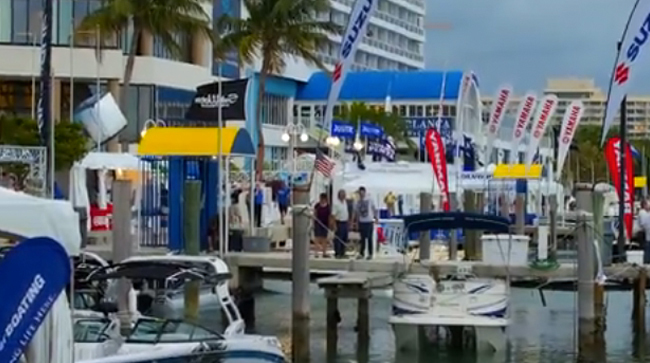 Like all of the boats in this line, a strong emphasis is put on bringing natural light and salt breezes into the cabin through the use of huge windows, sliding glass doors, a sunroof, and the atrium cabin design that helped convince us to name the Cantius 60 one of the Top 10 Boats at the 2015 Fort Lauderdale International Boat Show. Like all boats in this line the 50 Cantius is powered by Volvo’s IPS pod drives, and incorporates joystick control. For more information, visit Cruisers Yachts. Again, it’s too early in the game to find listings for the 50 Cantius. You can, however, check out some listings for the 48 Cantius and the 54 Cantius. Sleek and low-slung, the 380 LXF follows the design trends we’ve seen in other large Scout models. 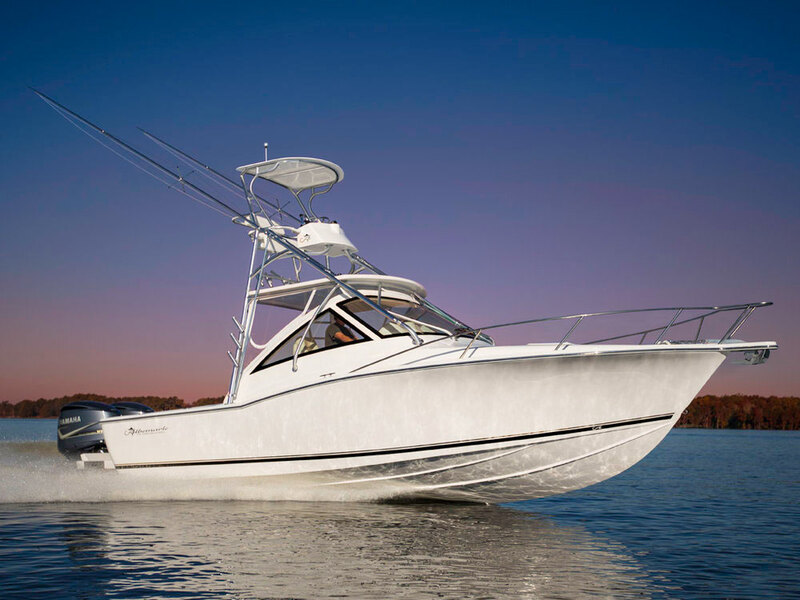 Scout Boats is known for innovation, and models like the 350 LXF, which was the first model we saw to fully integrate Mastervolt CZone digital switching with a Garmin electronics suite in an outboard-powered fishboat, offer proof that the reputation is well deserved. While we haven’t seen the yet-to-be-introduced 380 LXF in person just yet, we’re betting that this model will hold some similar surprises. What we do know at this point is that the 380 LXF will have Yamaha power and Yamaha Helm Master joystick steering to take control of either triple or quadruple powerplants (Mercury with Skyhook is an option); an extensive console cabin with a galley, stand-up head, 6’5” berth, and air conditioning; an epoxy-infused twin-step hull with 20 degrees of transom deadrise; and a monstrous 200-gallon livewell in the transom. Notable standards include a 5kW diesel genset with a 20-gallon tank, CZone digital switching, and an anchor windlass system with a washdown. We seriously suggest boat shoppers interested in this model consider adding the Seakeeper gyroscopic stabilization system, which is down-right awesome (learn all about it in How Seakeeper Works: Gyroscopic Stabilization for Boats). For more information, visit Scout Boats. Alas, in this case once again we’re too far ahead of the curve to have any listings for the model yet. That said, there are over 450 new and used Scouts to choose from currently listed on boats.com. 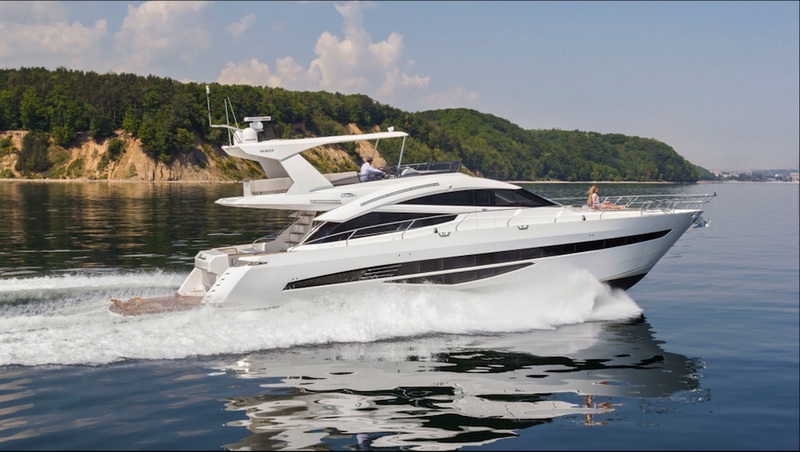 The Tiara F53 is the latest addition to the Tiara line, and the second flybridge model patterned after their Coupe series. 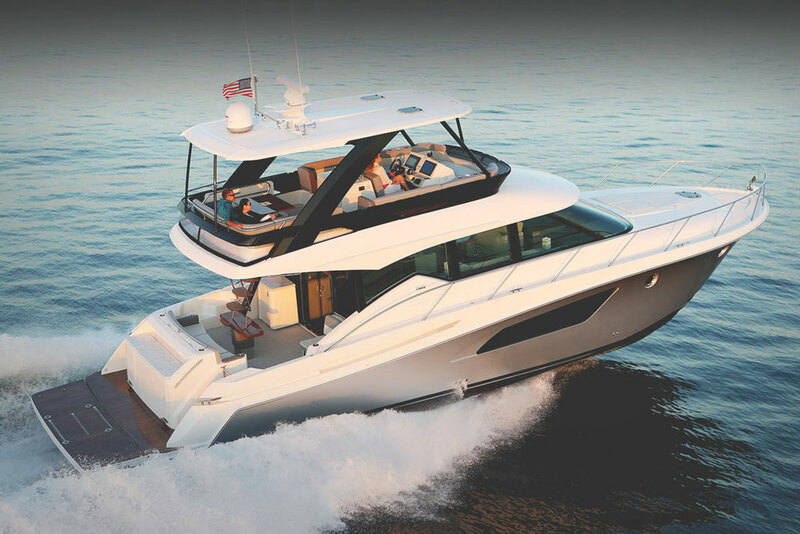 At the Fort Lauderdale boat show just a few short months ago, Tiara introduced a flybridge boat derived from their new Coupe series: the Tiara F44. 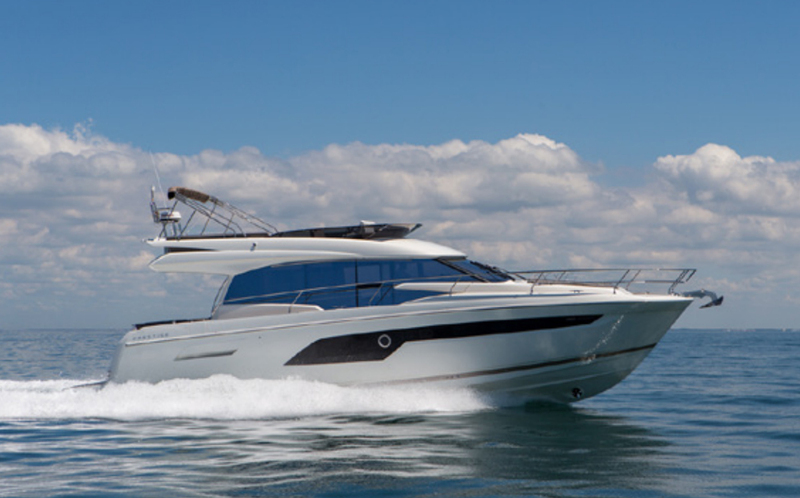 And like the F44, the all-new F53 is essentially a coupe with a flybridge on top. While putting a bridge on a coupe does mean you lose the huge overhead sunroof, it also brings a completely new social area to the boat. On top of that, by moving the helm up to the bridge the boat gains space in the main cabin, which previously had to be dedicated to the helm. Not that the 44 doesn’t have gobs of space in the saloon in the first place—utilizing a galley-aft design that allows for interaction between the cockpit and galley social and food-prep zones, the saloon has a huge settee/dinette plus a second settee, and an atrium-like passageway to the staterooms. The F53 also provides surprisingly sprite performance according to Tiara, cruising in the low to mid 30’s and hitting 38.7 MPH at wide-open throttle with a pair of Volvo B11 IPSII 950’s. For more information, visit Tiara Yachts. What luck—the first Tiara 53 Flybridge listing is up.